My first thought as we ate the pizza I made for dinner the other night was that it was really good and maybe I should post it to my blog. My second thought was that even though it was good, it was just a simple pizza...and I had posted other pizzas...and well, maybe I would just let it pass. Then I thought about the comment I made in my final post of 2016 about sharing more of the simple and basic dishes that appear on my table day in and day out...even if they aren't unusual or "chef-y". 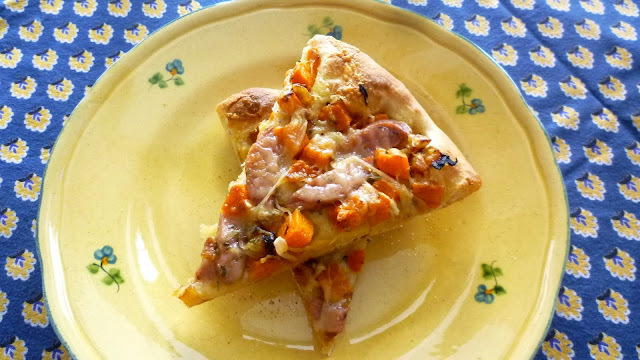 And suddenly this simple pizza seemed like a good way to kick off the year. If pizzas aren't on your list of easy, weeknight meals, they should be. Because they can be topped with almost any cooked ingredient, they are a great way to use up odds and ends of vegetables and cheeses. 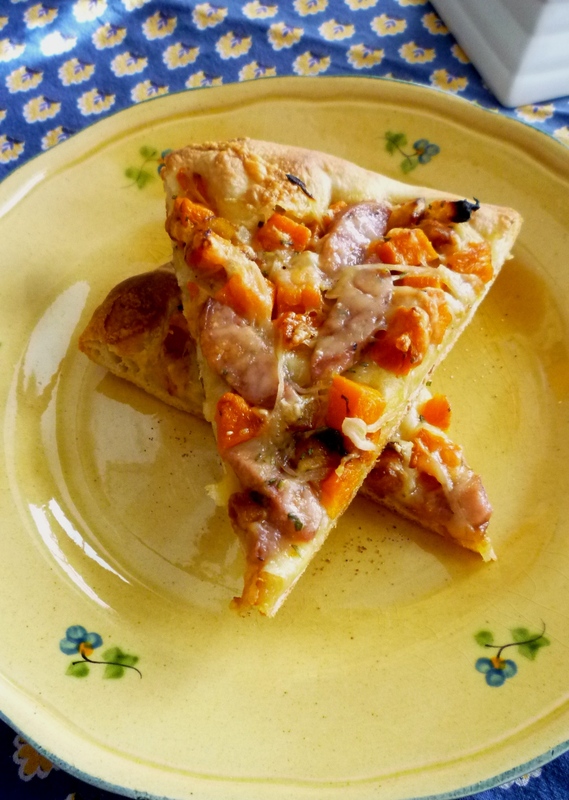 If you have foods on hand that you like to eat, odds are you can come up with a flavorful combination for a pizza. Just make your dough (more on that in a minute), choose a sauce (plain or seasoned olive oil, tomato sauce, reduced cream, seasoned ricotta...even a vegetable purée) and prepare/cook your toppings while the oven heats. If you think your oven won't produce a good pizza, think again. If you have a pizza stone and your oven will hold a temperature of 500° F, your oven is capable of producing a respectable pizza. If you don't have a stone, you should take some of your holiday gift money (doesn't everyone get gift certificates these days?) and buy one. It is a very small investment...and one that you won't regret. 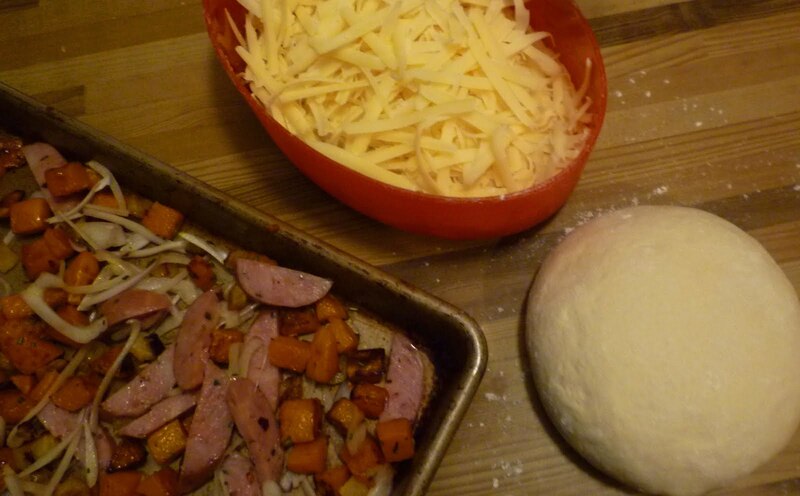 While you're at it, pick up a peel (not strictly necessary—I made good pizza for years without one—but using one will produce a superior crust). Then, stop at the grocery store on the way home and buy a bag of semolina flour (you can of course dust your peel with flour...but a semolina dusted peel is pretty much stick proof). With practice you will be making consistently delicious pizzas in no time. As for the dough....if you know how to use your food processor, you can make delicious pizza dough. I have been making pizza dough for years the old fashioned way—mixing and kneading by hand. But a couple of years ago I started to make it in the food processor because it's just so quick and easy. I still occasionally make it by hand....but there is really no reason to other than that I occasionally want to slow down and enjoy the process of kneading. (I give directions for both methods in the recipe.) If you are still dubious about making your own, you can probably find a grocery store that sells freshly made dough in their prepared foods department. I know that Whole Foods does this, and I'm sure there are others. As I said, last night's pizza was particularly good. 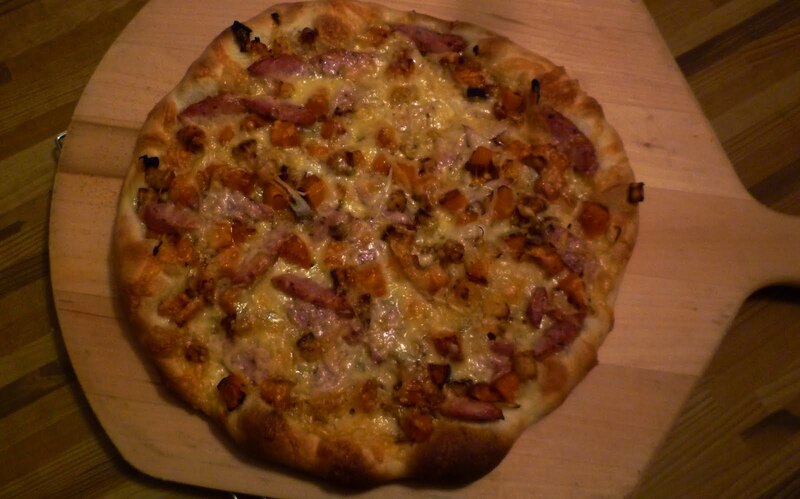 And since it included ingredients that I always have on hand during the fall and winter months (a chunk of winter squash...a Pink Lady apple...shallots...sausage...Dubliner cheese....), I know I will be making it again. I hope you will make it too...or better yet, come up with a new favorite of your own using the ingredients you like to keep on hand. Place the squash and apples in a bowl and drizzle with just enough olive oil to coat. Season with salt and pepper and toss well. Transfer to a small baking sheet (a quarter sheet pan is perfect) and roast in a preheated 450° oven until tender and beginning to brown—about 20 to 25 minutes. When the vegetables are done roasting, scatter the shallots, rosemary, pepper flakes and sausage over and toss to combine. Increase the oven temperature to 500°. I like Aidells Roasted Garlic & Gruyère Smoked Chicken Sausage, but any favorite cooked sausage that will go with the squash and apples would be fine. Kielbasa would be excellent. You could also cook a fresh Italian sausage link and cut it in a similar fashion. I love the nutty taste of Dubliner and I always have it on hand. It is a great snacking and melting cheese. 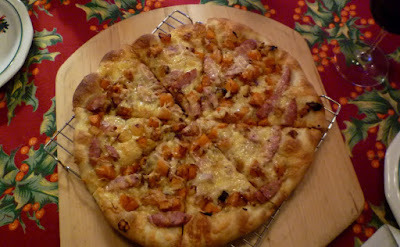 It is particularly good with the squash and apples on this pizza...but there are other cheeses that would work well. A good, sharp Cheddar...Fontina...low-moisture Mozzarella...etc.